Need a few extra pairs of hands to help with the holiday season? Lisa, over at Lisa's Hands of Time is offering a special discount to all of you (new customers) for the month of December. Readers that have been here a while are probably familiar with Lisa, she's sponsored a number of giveaways for the Bloggery in the past. Those of you who are new, read on. The holiday season has begun and is filled with a lot of hustle and bustle and the inevitable stress of planning parties, errands, shopping, entertaining, wrapping, decorating and gift-giving.... and there never seems to be enough time to get it all done! Lisa's Hands of Time Concierge is a personal concierge service that provides errands, shopping, organizing, research, wait-services, and a 'sleigh-full' of services that can ease your holiday stresses. Lisa's team of elves will help with the inevitable gift-buying and gift-giving process. They provide shopping services; which includes planning, shopping, fighting the traffic, parking and long lines. Her staff will also wrap all your gifts, hand-deliver locally, or take to the post office or shipping store. They will assemble furniture, toys, appliances etc. They even help with the holiday cards, addressing, stuffing, sealing, and stamping. Lisa's Hands of Time Concierge will also return items, or exchange items after the holidays too. They also provide help with decorating (the house, the tree, the table) planning for parties, pickup of food or catering items, grocery shopping, etc. 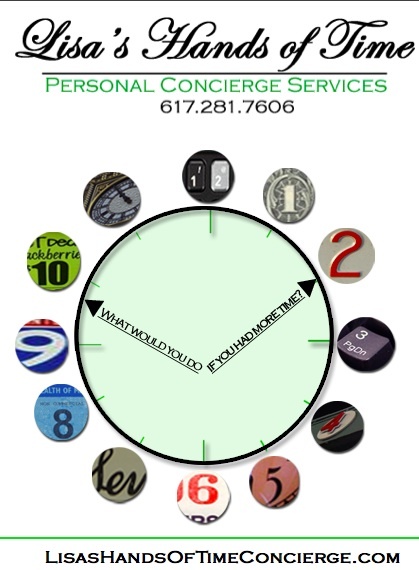 Lisa’s Hands of Time Concierge is offering 10% off services during the month of December to any new customers – be sure to mention the Beantown Bloggery. My personal favorite service? Getting someone to build Ikea furniture for me. I think her elves do that too. Building dressers, in particular, is a huge pain ... at least for me it is. Click (here) to visit Lisa's Hands of Time Concierge. 0 Response to "10% Off at Lisa's Hands of Time Concierge"